Couple funny stories about bugs this week. I was babysitting and the two boys found a roly poly outside while they were digging in the dirt. The four year old went on and on about the bug for about five minutes. The two boys were building a home for the bug, having a great time with their new pet. Today at work I had a single man come into the restaurant and sit in my section. At one point when I went over to the table, he held his hand out to give me something. “I found this on my table,” he said. It was an ant. He really wanted to give it to me, so – thinking it was dead – I took it from him planning to throw it away. It wasn’t dead and as soon as he let go of it in my hand, it frantically ran up and around my arm. Hmmm… not sure why he felt he needed to hand me a live ant but I put it outside. I told Jenn about this interaction and she laughed and said she wouldn’t be surprised if this man had a coin purse full of ants and handed them out to strangers just to see their reactions. 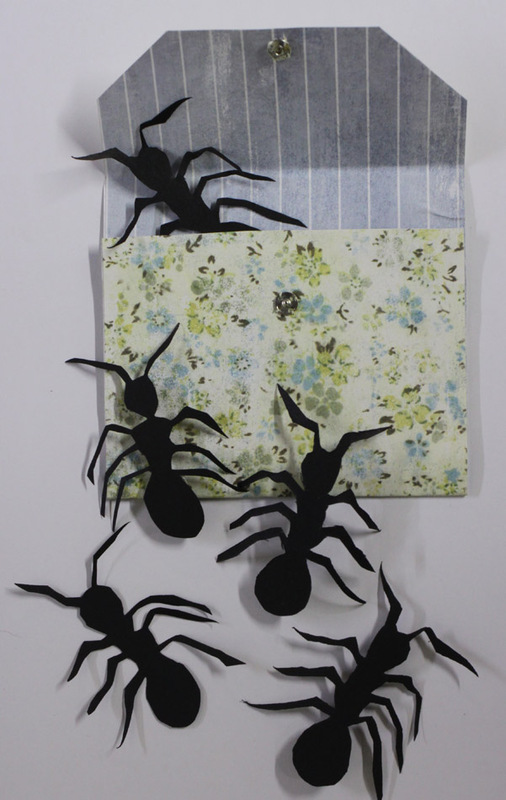 So I made a coin purse full of ants.